"Today I feel 20 years younger." By The Numbers: 310 pounds at my heaviest, currently 225 pounds, for a total weight loss of 85 pounds. The Weight Gain: Throughout my 20s and into my early 30s, my weight remained fairly consistent because I had an active lifestyle. As I approached mid-30s, my weight began a steady upwards trend. I associated this with a reduction in physical activity as I focused more attention on starting my family and home renovations. Occasionally, I would drop a few pounds through an attempted diet fad, but the weight would soon reappear and further increase. At age 40, I weighed about 290 pounds. At this point I started a serious weight loss effort involving exercise and diet. I managed to shed 80 pounds, and the weight stayed off for about five years until my job responsibilities changed and I found myself working long strenuous hours. I soon gave up going to the gym and found I had little time for exercise. By the time I came home from work in the evenings, all I wanted to do was relax, eat and watch some TV. My once healthy interests had now digressed into indulging in fattening foods and watching TV or surfing the net. When I hit my late 40s, I broke through the 300-pound mark. Final Straw: I was interested in photography and enjoyed taking pictures outdoors. On a cold January day about three years ago, I ventured out to the beach with camera in hand when I slipped on some ice and fell. It was not a serious fall, but due to my excessive weight, I ended up tearing my abdominal tissue and developing a hernia. I developed heart arrhythmia issues in my early 50s and underwent two procedures to address them. When talking to a surgeon, he suggested weight loss would reduce the strain on my heart significantly and may help reduce re-occurrence. Meanwhile, The manufacturing plant I was employed at for 33 years ceased operations and I found myself retired in February 2014. The first couple of months were spent reflecting on what had happened over the recent years and what I needed to do going forward. I decided I could either dwell in self-pity at the loss of my job and poor health or move forward and attempt some positive change in my life. The Plan of Attack: Initially I attempted some basic exercise and diet. I had no stamina and my knees, back and ankles ached from the effort. I started going to the gym and found myself frequently injuring myself while attempting to exercise. Weight loss for the first couple of months was slow and irregular. Some weeks I would lose a couple pounds; others I would show a slight gain. I realized two obstacles I needed to overcome to be successful were to develop exercise and diet strategies. From a diet perspective I continued to work with a dietitian and we decided I needed to do a better job of tracking my food intake. I used My Fitness Pal and it allowed me to compare my daily intake against my goals. I soon realized that diet alone was not going to cut it. The Exercise Factor: I signed up with a Goodlife Fitness personal trainer after two months of attempting exercise on my own and then started to see a steady weight loss and fitness improvement. After a thorough assessment, my trainer Len designed a customized workout plan that I could manage, consisting of specialized exercises to build strength and flexibility, while proceeding with weight loss. Sensitive to my previous heart condition, we also carefully monitored exertion levels. 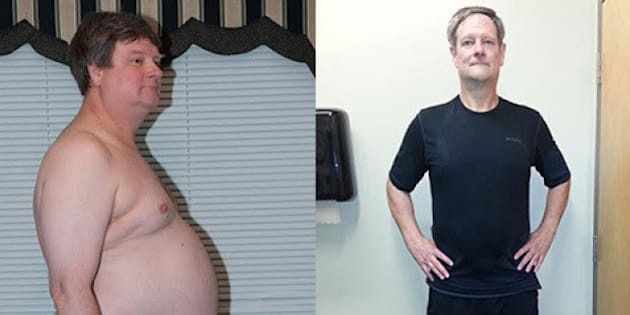 As my health and fitness improved, the exercise program continued to evolve, until a year later I achieved my goal weight of 225 pounds and lost 14” off my waistline. Currently, I work out at the gym two to three times per week. I start with a 20-minute warm-up on one of the cardio machines and then progress to an hour of strength training using free weights or machines. I ride my road bike three times a week at distances of 40 to 60 km. If I cannot get out for a ride, I substitute additional time on one of the cardio machines at the gym. I am planning to return to spinning classes in the late fall and winter, once I can no longer ride the bike outside. My wife and I will usually walk for an hour a couple of times per week as well. The Food Element: I started consuming more lean proteins such as chicken, fish and egg whites, as well as plenty of green vegetables. My wife and I enjoyed eating out (typically four times a week), so it was difficult for me to maintain a reasonable caloric intake. We reduced this to once a week. I did not cut out any foods completely. I reduced my intake of carbohydrates such as pasta and breads, as well as foods that were higher in fat content. I still indulge in the occasional pizza, hamburger, French fries and pasta with cream sauce. The difference now is balancing this intake with my other intakes and activities for the week. The Current Day-to-Day: Today I feel 20 years younger. I have plenty of energy and strength to take on new challenges. I have enjoyed a return to road biking with friends I hadn’t ridden with for over 10 years. I have started working on home improvement projects I had neglected over the past 10 years. I still find My Fitness Pal a valuable tool for balancing my daily food consumption with my activity level. I monitor my weight every couple of days and make adjustments to my activities or consumption as required. I maintain regular exercise both at the gym and out. Don’t give up on exercise. I let my job dominate my life for a period of time as demands and responsibilities increased. While it is sometimes necessary to put a little extra time in now and then, you need to maintain a balance in your life with maintaining your home life and fitness. Spending prolonged amounts of time at work in the long run not only cost my health and fitness, but made me less effective in accomplishing tasks. As a more fit individual, I am better able to deal with stress, think clearer and make more effective decisions.